Santo Domingo.- The governments of the United States and the Dominican Republic on Wed. agreed to facilitate the investments of US companies in the Caribbean country through the financial entity, Overseas Private Investment Corporation (OPIC) which simplifies the approval process. 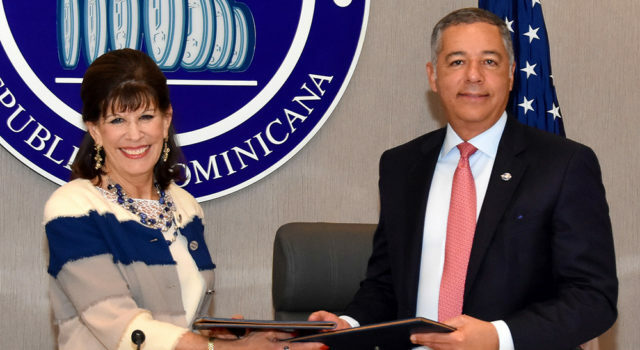 US ambassador Robin Bernstein presented the document to Finance minister, Donald Guerrero, who signed the agreement with OPIC president and CEO, Ray W. Washburne. In a statement Guerrero said the agreement facilitates the use of the OPIC’s loan guarantee and political risk insurance programs by US companies looking to invest in the Dominican Republic. It also updates procedures according to a long-standing agreement between Washington and Santo Domingo and “will simplify the process for US companies, supported by OPIC, to invest in the Dominican Republic,” said the diplomat. “The United States continues to work to ensure free and fair trade with its allies and improve access to regional markets in Latin America transparently,” Bernstein added.